The Four Seasons Hotel Gresham Palace, which opened again in 2004, started life as a temple to capitalism, created in 1907 for the London Gresham Life Assurance Society. In 1999, the Canadian-based Four Seasons Hotels and Resorts and Gresco Investments Ltd. signed a development agreement the District V local council to restore the building to its former glory and create a luxury, 179-room (including 14 suites) five-star hotel at a cost of some $84 million. The site where the Gresham Palace now stands originally housed a neo-classic palace called the Nako House, designed by József Hild and built in 1827 by wholesale merchant Antal Deron. In 1880, the London Gresham Life Assurance Company bought the Nako House as its foreign headquarters on this site but then, in 1903, decided to demolish the Nako House and build from scratch. The Gresham Palace was designed by Zsigmond Quittner and the Vágó brothers and took three years to build, finally opening its grand gates in 1907. The building was conceived as a kind of monument to Sir Thomas Gresham (1519-1579) the 16th century financier to Queen Elizabeth I, founder of London’s Royal Exchange and inventor of Gresham’s Law which states that, “Where legal tender laws exist, bad money drives out good money”. The time of completion occurred during Hungary’s Golden Age and some of the most famous artists and craftsmen of the time worked to make the Gresham Palace one of the most glamorous buildings in Pest, and one of the finest examples of Art Nouveau architecture in the world.The artist Géza Maróti created many original sculptures for the building. 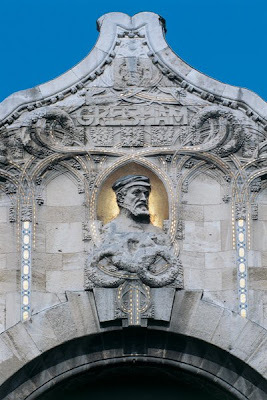 Sculptor Ede Telcs created the relief of Thomas Gresham looking a bit like a jaunty sea captain at the top of the facade (shown in the picture at the top of this article), staring out at a slight angle to the Danube and across the Chain Bridge towards Buda. The Gresham Palace was one of the first buildings in Budapest to have its Art Nouveau exterior illuminated at night and no expense was spared on the decor and the embellishments inside either. Every bathroom and kitchen was fitted with ceramic tiles from the Pécs Zsolnay porcelain factory and Miksa Róth was commissioned to make the gorgeous stained glass windows on every landing. The wrought iron peacock gates came from the prestigious Gyula Jungfer workshop and furniture maker Endre Thek was commissioned to fill the rooms with his elegant creations. The Gresham building also featured state-of-the-art technology, full electrical wiring, central heating, two-meter-thick cellar walls to prevent flooding and something known as a ‘central vacuum system’ which was a kind of communal vacuum cleaner which wound its way around the building. Cleaners only had to connect a tube to a nozzle in the wall of the apartment and there was instant suction. The ground floor and first floor hosted the Gresham Company’s offices, the Gresham Café and a finishing school for daughters of the aristocracy called “English Young Ladies”. The second and third floors were comprised of around half a dozen luxury apartments where many of the country’s elite took rooms. Government minister Count Gyula Andrássy took rooms in the Gresham Palace, his brother Géza was conveniently chairman of the board of the Gresham Company’s Hungarian subsidiary. The fourth floor contained more modest apartments for the company’s traveling insurance salesmen while the fifth floor just under the roof housed the servants’ quarters. Between the wars, the Gresham Café was the meeting place for the Gresham Circle of artists. The Podium Cabaret in the basement was the place where Bohemian artists rubbed shoulders with fur-clad aristocrats while they watched the risqué and satirical shows. The cabaret was closed for a time in the twenties for being too ‘daring’ but enjoyed a second lease of life between 1936 and the outbreak of the War.In the Café above, important figures such as István Szőnyei, József Egry, Pál Pátzay and Jenő Barcsay discussed new movements in art. The radical Nagybánya school gathered here as did writers and artists, all followers of a movement that urged a humanist, respectful approach to art, one that preserved the values of the past. The Gresham Circle ceased to exist in 1944. During World War II, the building was hit bombarded from across the river by revolutionaries trying to dislodge the Russians from the Interior Ministry next door. During the winter of 1944-45 Soviet soldiers occupied the Gresham Palace and burnt much of the furniture to keep warm while the residents huddled in the cellar. When the Chain Bridge was blown up during the German retreat, the shock waves blew the peacock gates on Mérleg utca right off their hinges. In 1948 the Hungarian Communist Government nationalized Gresham Palace and scores of new tenants moved in, sub-dividing the palatial apartments into smaller flats. The Gresham Café managed to keep going through the grim fifties and sixties, and in 1957 even had the first Wurlitzer organ in the country. Between 1948 and 1990, the building declined into a sad state disrepair. The café closed and a Chinese restaurant took its place, then a casino moved in. Small businesses, a hairdresser and a locksmith moved into the arcade but all around the walls were crumbling. In the seventies, the building was listed as national protected landmark in the late 1970s and in the 1976 list of protected monuments the Gresham is described as being 'of monument character'. With the change of political system in 1990, the Government transferred ownership of Gresham Palace to the District V Council. Oberoi, an Indian hotel chain offered to restore the palace in return for permission to turn it into a hotel. A deal was announced in 1991, however the Council had not considered the 38 remaining tenants of the building. Much legal wrangling ensued and four years later, Oberoi had lost patience and sold its interests to Fejér & Associates. In 1997, Gresco entered the picture and arranged for the Four Seasons Hotels and Resorts to manage and operate Gresham Palace. Gresco agreed to the National Board for the Protection of Historic Monuments (OMVH) which had earlier granted license on condition that the exterior, the ceramic decorations, the glass interior arcade and the stained glass windows on every staircase be restored in a sensitive manner. To see the stunning interior in all its glory, indulge in a calorific chocolate cake at the elegant Gresham Kávéház (coffee house), sip a Martini from a soup tureen-sized glass at the alabaster and black marble bar before dining in style at the superb Páva restaurant where the menu is overseen by Moroccan executive chef, Abdessattar Zitouni. The Páva restaurant serves a contemporary fusion of Italian and Hungarian cuisine complemented by a list of 140 Hungarian wines, selected monthly by a group of independent wine writers. The Szepsy Tokaji dessert wine, the 'king of wines and wine of kings', according to Louis XIV, makes a truly aristocratic accompaniment to the house’s foie gras. Save a tiny wiggle of your digestive tract for the gourmet delight of carpaccio of pineapple for dessert. Then strut off to bed like the aforementioned peacock. *Readers in Brussels might be interested to learn that a building in Belgium's capital has a hallway devoted to Thomas Gresham. You can see a relief of and tribute to the insurance salesman par excellence in the café and shop entrance hallway of the Palais des Beaux-Arts on Rue Ravensteinstraat.